We are inportant supplier of Flail Mower. T And U Systems Automobiles Pvt. Ltd.
We are main supplier of Flail Mower. We are an ISO 9001:2008 & CE certified manufacturer and exporter of agricultural implements that are sold under the brand name “Shaktiman. Our farm implements are known for their accurate designs and resistance to corrosion. 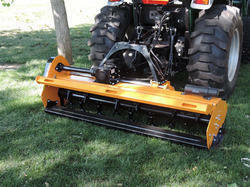 Side flail mower is the right attachment for road maintenance and municipalities. For catering the variegated demands of our respected clients, we are highly engrossed in providing a wide range of Rotary Flail Mower. We are supplier of Flail Mower. We are dealing in Flail Mower. Our side flail mower is a special shredder with an hydraulic system to adapt the machine. the machine is the best solution to keep clean the roads, ditchers and between trees. You can also use the machine as normal flail mower along the field. all agrital's agricultural implements are very easy to use in any conditions. SHAKTIMAN Flail Mower – SFM is specially designed for cutting heavier grass with which normal mower cannot cope up. It is best suited to provide a rough cut to taller grass where contact with loose debris may be possible such as roadsides. 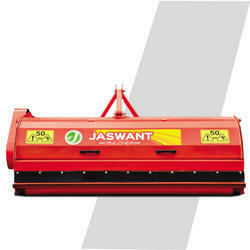 We are best supplier of Flail Mower. We are engaged in supplying Flail Mower.